I've found this.one George and Julianne Moore arriving at hotel. Any more pictures? He's a Hollywood heavyweight who recently welcomed the birth of twins. 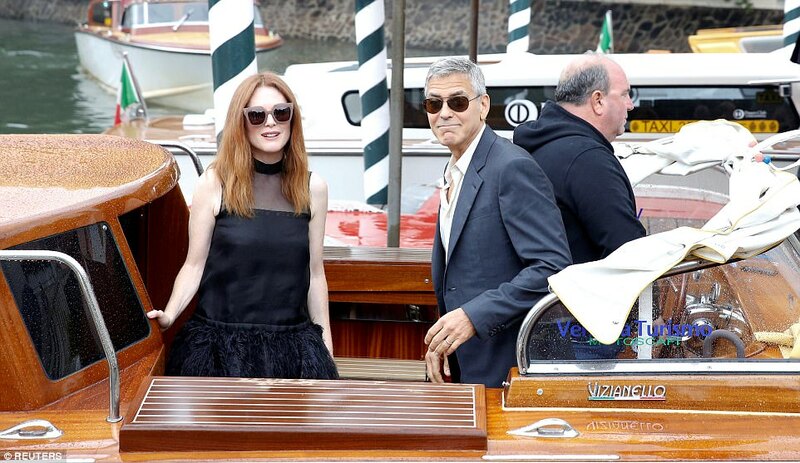 And George Clooney, 56, had the happy glow of a new father as he made a handsome appearance alongside co-star Julianne Moore at a photocall to promote new flick Suburbicon at the 74th annual Venice Film Festival on Friday. 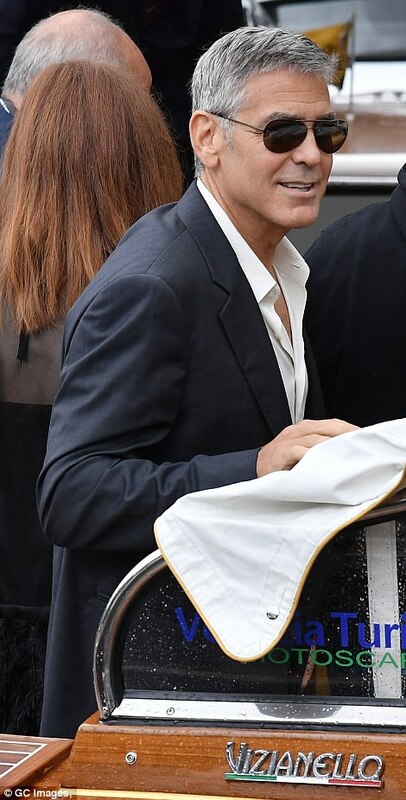 The star looked classically handsome as he rocked a fitted navy blue suit, teamed with an ivory open-necked shirt for the glittering appearance at the Hotel Excelsior. Like a true A-lister he hid his eyes behind aviator sunglasses as he wrapped a friendly arm around his co-star. 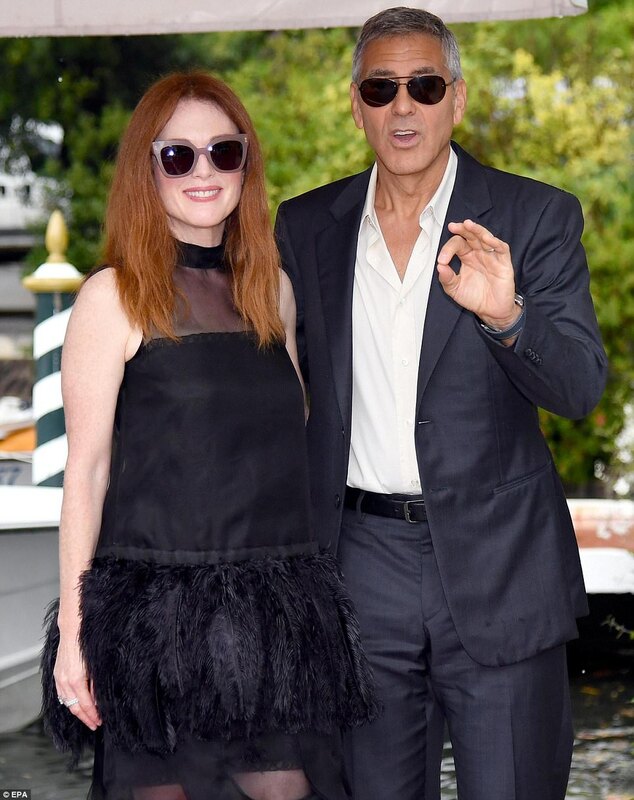 Stunning Oscar winner Julianne,56, wowed in a flirty ebony minidress, with featured a semi sheer neckline and a feathered hem, with a lacy scalloped hem as she posed up with her pal. Her flame red locks were worn sleek and straight, parted in the middle and she accentuated her pretty features with a light dusting of make-up. The Still Alice star added height with elegant ebony peep toe heels and slipped on a pair of Jackie Onassis style shades. 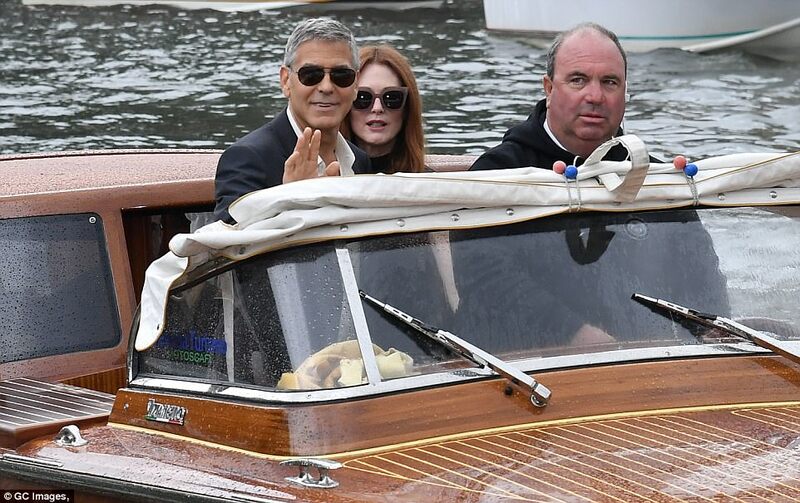 Making a truly A-list arrival, and in the spirit of the city, the stars jetted into the photocall via luxury boat with George giving a cheery wave as he arrived. Suburbicon, which also stars Matt Damon, is a crime-comedy film about a peaceful suburban community which hides a dark criminal underbelly. George once again teamed up with the Coen Brothers and also serves as director on the film, due to be released September 2. 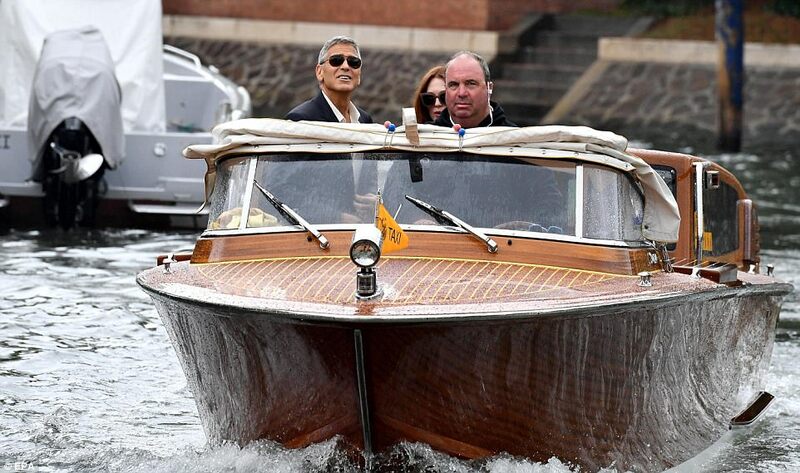 Bourne Identity star Matt, 46, was also seen in the Floating City as he rocked a casually-clad ensemble as he arrived at Lido Beach. The star showed off his hunky physique in a slate grey striped t-shirt which he paired with navy jeans and black and white sneakers. 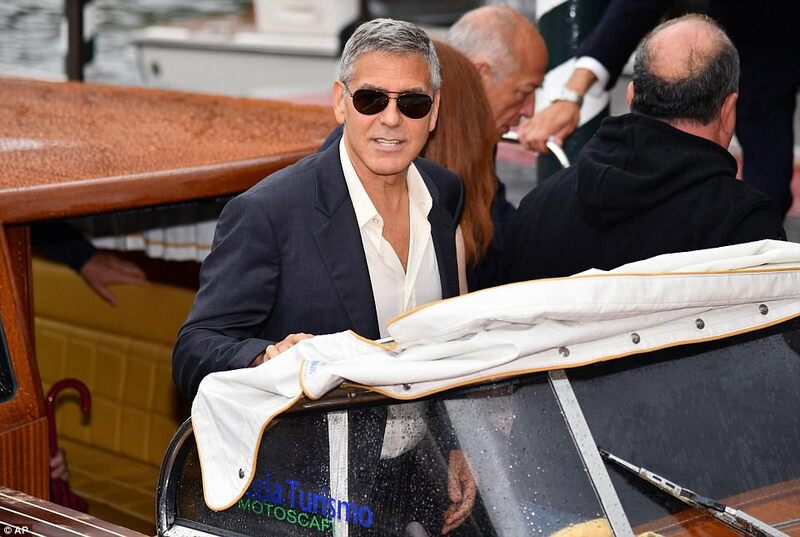 He gave a casual wave to fans as he slipped on a pair of shades for his day of promotional duties. Love how they called Gio George's "minder"! Makes him sound either too old or too young to be safe out alone! This is premiering tomorrow. Wait for reviews and red carpet. So excited! Yep Sevens! It is exciting. George will be in his element. Can't wait. The fact that after all the years the Daily Fail has been covering George and they still don't know Gio's name? Just pitififul. Maybe they should read here on COH. They could learn a few things about George. Getty Images has a lot of pictures from today. Has anyone seen any reviews of the film? The only one I saw (The Wrap) wasn't very good, although the reviewer didn't seem to like anything George has ever done so I'm hoping it's biased.